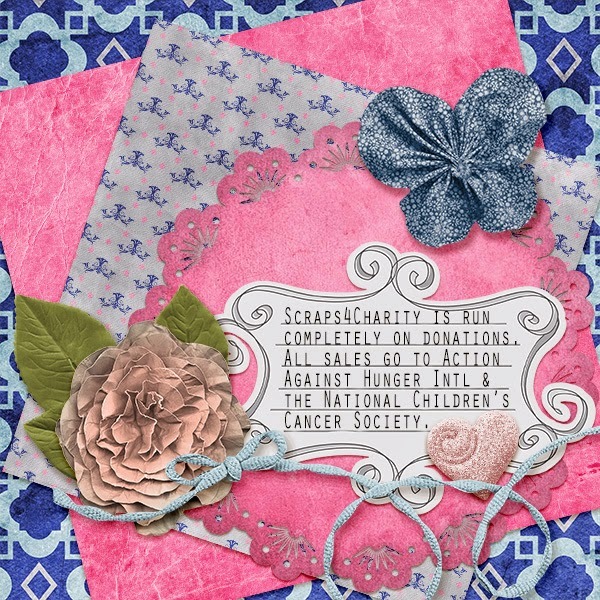 MyMemories Blog: Today's Daily Designer....Scraps4Charity! Hi! I'm here to tell you a bit about Scraps4Charity. It is a coalition of anonymous designers who are working on raising money for charity. This year, the charities we are supporting are Action Against Hunger International and National Children's Cancer Society. Both of these charities do a wonderful job of helping their target demographics. Action Against Hunger helps provide food relief worldwide to populations affected by natural disasters, war, and poverty. The National Children's Cancer Society provides financial support, as well as emotional support, to families with a child with cancer. They also help provide resources for those working hard to treat young cancer patients. You can read about them here: Action Against Hunger Intl. (http://www.actionagainsthunger.org) & National Children's Cancer Society (http://www.thenccs.org). How do we operate? MyMemories Designers send page kits, and other products, to us to place in our shop. All sales of those products are sent to a private PayPal account and at the end of the year, 50% goes to AAH and the other 50% goes to NCCS. How can you help? Simply make purchases in our shop. If you want to join our community, you can also check out our board on the MyMemories.com forums (http://forums.mymemories.com/?forum=369621). We often run challenges that you can participate in, and doing so will not only give to charity, but will also give you an extra bonus! We really hope you come around and help us help others. Enjoy 20% off our store all week long, and thank you! Enjoy 20% off Scraps4Charity in the MyMemories Design Shop until October 3!